I am getting back to honoring the Brooklyn Dodgers that are alive so here is #12 in my list from oldest to youngest. Donald Andrew Lund was a backup outfielder for the Brooklyn Dodgers, St Louis Browns and Detroit Tigers. He was born in Detroit on May 18, 1923. He shares a birthday with my dear aunt Nora and my friend Sandi who is a St. Louis Cardinal fan. Outfielder Don Lund earned nine letters at the University of Michigan and was also drafted by the Chicago Bears. After his playing career ended, he was a Detroit Tigers coach in 1957 and 1958. He was then the Tigers’ farm director in 1963, Scouting director in 1964, and director of player development from 1965 to 1970. The young Lund attracted attention in 1947, a pennant-winning year for the Brooklyn Dodgers, when he went 6 for 20, slugging .700 with 2 doubles and 2 homers. He did not appear in post-season play. 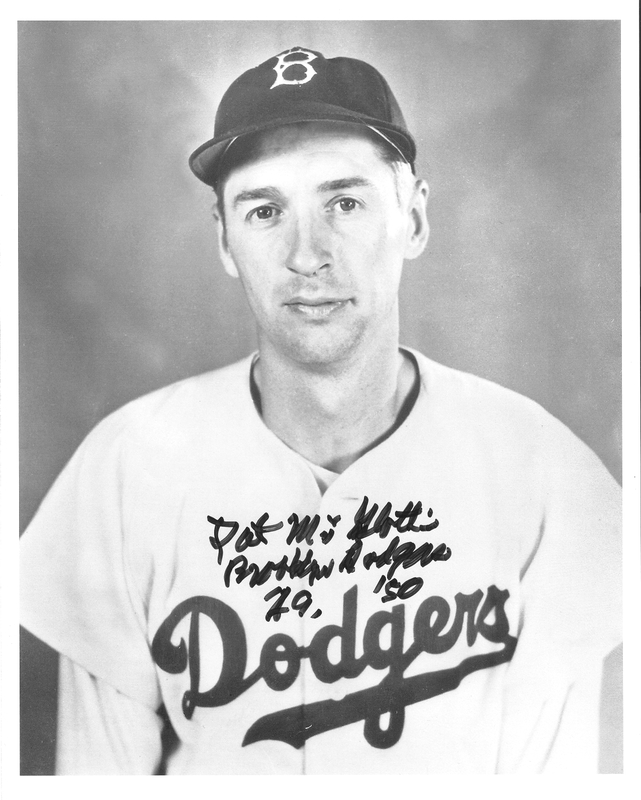 Lund was one of 11 players used in left field by the Dodgers that season, who never did pick a regular left-fielder in the late 1940s. His year with the most major league at-bats was 1953, when he hit .257 in 421 at-bats with the Tigers. Al Kaline was an 18-year-old rookie that year, and the following year Kaline became a regular, while Lund was a backup. Lund briefly managed the 1956 Jamestown Falcons. He returned to his alma mater as head coach from 1959 to 1962, leading the school to the 1962 College World Series. checking the Dodgers media guide, Mr. Don Lund wore uniforms #8 #17 #25 #40. He was in 4 games in 1945, 11 games in 1947 and 27 games in 1948. He went to the Tigers in 1948. I did not know that there is a SABR chapter called Don Lund Chapter! the Don Lund Chapter serves the Southeastern Michigan area. Very nice! Also in 1997 SABR conference #27 in Louisville, Kentucky saw a player panel highlighted by Pee Wee Reese that also featured Ed Stevens and Don lund. Jim Bunning was the keynote speaker. From everything I read about Mr. Lund, he is another terrific person. Basinski was born on 11/4/1922 in Buffalo, NY. He wore uniform #3 for the Dodgers. Eddie was signed after a tryout by the Dodgers out of the University of Buffalo even though he hadn’t played baseball in either high school or College. 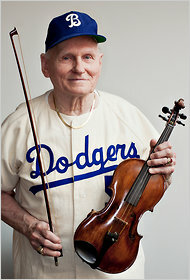 Eddie debuted with the Brooklyn Dodgers in 1944. He was the Dodgers regular shortstop while Pee Wee Reese was in the military in 1945 but lost his job when World War II ended an Reese returned. He made a prototypical rookie mistake when first coming up to the National League: hitting .389 after two weeks, he told a reporter that “Any man who can’t hit .300 in this league ought to go get a lunch bucket.” Opposing pitchers never let him live down those words. Here is a video of Portland Baseball history with Eddie Basinski and Vince Peski. Eddie tells some wonderful stories that had me cracking up. Ad here is a another video. A wonderful interview of Eddie Baskinksi by KrisPorterSports. In there he talks about Branch Richie & Leo Durocher. Charles Steven Kress was born in Philadelphia on December 9, 1921. He wore uniform #5. Chuck Kress served in the U. S. Army from 1943 to 1945. 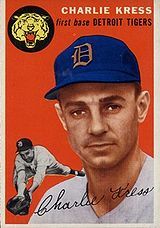 Kress was a first baseman 17 seasons from 1940 to 1959, four in the Major Leagues and 16 in the minors. He played first base for the Cincinnati Reds in 1947 & 1949. With the Chicago White Sox from 1949 to 1950. On 06-09-1954, The Brooklyn Dodgers traded Wayne Belardi to the Detroit Tigers for Ernie Nevel, Johnny Bucha and Chuck Kress. Kress had 12 at bats with the Brooklyn Dodgers in 1954 and batted .083. 1957: The Erie Sailors from the New York-Pen League of the Detroit Tigers. 1958: Durham Bulls from the Carolina Leagues of the Detroit Tigers. 1961: Des Moines Demons of the Three-I Leagues of the Philadelphia Phillies. Chuck Kress, who played with the Reds, White Sox, Tigers and Brooklyn Dodgers responded to some questions for me. He mentioned that his favorite team is the Mariners. His favorite recent player is Edgar Martinez. Chuck did say that he had a lot of great memories relating to his time with that legendary Brooklyn team. 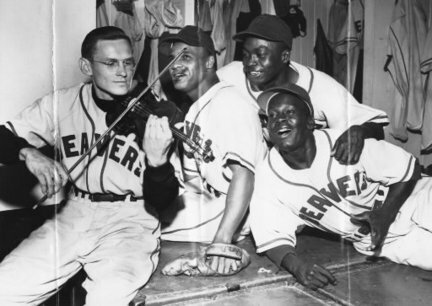 Mr. Kress notes that he is proud of the fact that he got to play with Jackie Robinson, Roy Campanella, Duke Snyder, and manager Walter Austin. He does remember playing in Louisville when he was with Columbus of the American Association. 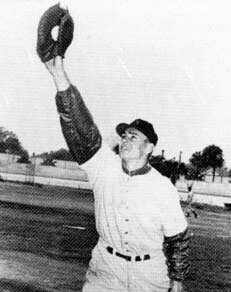 At age 19, Marv Rackley was signed by the Brooklyn Dodgers organization in 1941. He played for the Valdosta Trojans, the Durham Bulls and the Dayton Ducks. On October 5, 1942, Rackley entered the military service with the Army Air Force at Fort Jackson, South Carolina. He spent the next three years in service. Sergeant Rackley returned to the Dodgers organization in 1946. He joined the Montreal Royals where he played alongside Jackie Robinson. Rackley batted .305 with the Royals and was in the Dodgers line-up for the second game of the season in 1947. In 18 games as a pinch-hitter and runner he batted .222 before joining the St. Paul Saints where he batted .316. In 1948, Rackley played 88 games with the Dodgers, batted .327, but with Hermanski, Reiser, Furillo, Snider, Shuba and Whitman all vying for outfield positions there was little room for him. On May 18, 1949, Rackley was traded to the Pittsburgh Pirates for first baseman/outfielder Johnny Hopp plus $25,000. Rackley reported to the Pirates with a sore throwing arm. Pirates complained they had traded for a player who was unfit. Hopp was returned to the Pirates and Rackley went back to the Dodgers (wonder what happened to the 25K) where he played in 54 games, batted .291 and appeared in two World Series games against the Yankees. In October 1949, the 28-year-old was purchased by the Reds for $60,000 but appeared in just five games the following season, spending most of the year with the Seattle Rainiers of the Pacific Coast League. He spent most of 1952 with the Birmingham Barons and joined the Baltimore Orioles of the International League in 1952. 1953 he batted .320 in 111 games with the Orioles. 1954 he batted .328 with the Richmond Virginians. He ended his career with the Atlanta Crackers in 1955 when he also managed for part of the year. Marv Rackley still lives in his native South Carolina. I could not find a current picture of Marv Rackley. I just noticed this is my blog post #500 !! 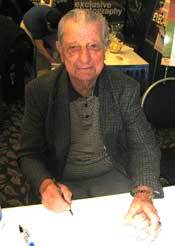 During a 17-year career Andy Pafko was one of the handful of players to appear in four World Series with three different teams, the 1945 Cubs, 1952 Brooklyn Dodgers, and the 1957 and 1958 Milwaukee Braves. Andy’s first year with the Dodgers ended on a sad note. That’s him in left field, dwarfed by the huge wall at the Polo Grounds, looking up in vain at Bobby Thomson’s pennant-winning home run off Ralph Branca. His luck changed in 1952, however, when he got into his second World Series, playing in all seven games for the Dodgers against the Yankees. Andy retired as a player after 1959 and coached for the Braves from 1960 to 1962. He began his minor league managerial career the following year, and by 1968 he had skippered teams in New York, North Carolina, and Florida for the Braves organization. He did some scouting for the Braves for a few years after that and then he his wife moved to Chicago. Ezra Mac “Pat” McGlothin was a pitcher for the Brooklyn Dodgers. He pitched in 8 games during the 1949 and 1950 seasons. His major league debut was April 24, 1949 and his final game on April 18, 1950. He spent time in the Minors with Mobile, St Paul and Montreal, pitching three career no-hitters in those venues. The Dodgers had 26 farm clubs in those days. In a heroic effort, Pat pitched 19 innings in a 5-4 game, knocked in three runs including the game-winner in the bottom of the 19th, and held Ted Williams without a hit in seven tries. Pat had a hit to tie the score in the 17th before ending the contest in the 19th. Pat McGlothin, owner of Mutual Insurance company has been serving customers in Tennessee since 1954. He enjoys exercising and watching baseball games.